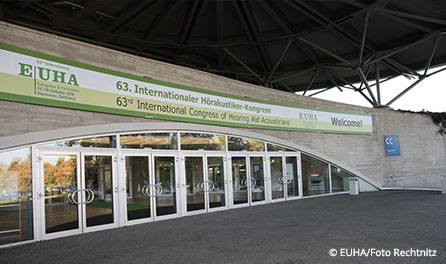 The Congress of Hearing Aid Acousticians and the International Industrial Exhibition together are the world’s largest event for hearing care professionals, which is held annually in Germany. It attracts over 8,000 visitors and more than 140 exhibitors from more than 80 countries, each year. The event is a cooperation project of EUHA (European Union of Hearing Aid Acousticians) and BVHI (German Hearing Aid Industry Association). EUHA is the host and organiser of the world’s largest international hearing care congress, and BVHI is the organiser of the industry exhibition. The German Hearing Aid Industry Association (www.bvhi.org) is the representative of hearing aid manufacturers operating on the German market. It articulates the interests of its members and is the communication body for all topics related to hearing technology, hearing care and innovation. The association is committed to increasing the use of hearing instruments by people with hearing impairment and to educating people hard of hearing. It also promotes cooperation with all groups involved in the supply of hearing instruments. These include hearing care professionals, ENT doctors, health insurance companies, other associations and interest groups, as well as politics. The platform www.Ihr-hoergeraet.de, which is organised by the BHVI, provides neutral and fundamental information on all topics relating to good hearing, hearing impairment and hearing instruments. Not only those who are affected by a hearing loss, but also their relatives will find valuable information and up-to-date reports on latest innovations and hearing care topics. In addition to informative content, the platform also offers various online hearing tests as well as a search tool for hearing aid professionals and ENT doctors in Germany.